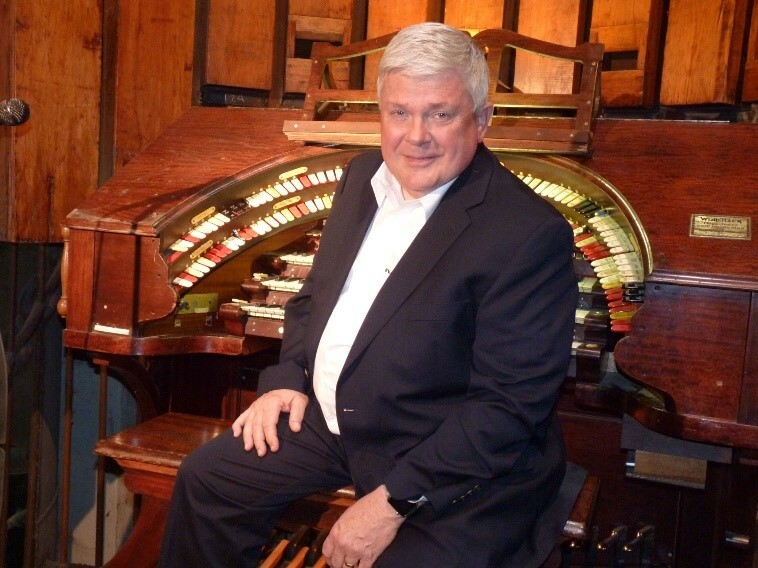 Since the age of 5 Larry Krupp has had a passion to play the organ. It started with the family’s Wurlitzer Spinet organ in the living room and he was soon picking out tunes on the instrument his father used to rehearse the church choir in their home. At age 13 he became a student of Bob Heil, himself a student and protégé of legendary theater organist Stan Kann. The Wurlitzer Spinet was soon upgraded to a new Hammond B3. When Mr. Heil went on tour for the Holiday Inn Corporation he arranged an audition for Larry with the eminently regarded Theatre Organ instructor John Ferguson who was living and working St. Louis at the time. Larry became John’s student at age 16 and continued studying Theatre Organ technique and registration even after he entered college until Mr. Ferguson moved to Indiana. While majoring in Piano performance at university Larry’s passion for the Theatre Organ continued, and continues to this day with a three manual Rodgers Trio Theatre Organ in the living room. Larry and his wife of 45 years, Bonita (also an organist and pianist) live with their two Great Danes in Collinsville, IL.